Four-year-olds are a wonderful mix of independence and sociability. They take pride in imitating adult behaviors and they enjoy interacting in small groups with peers. 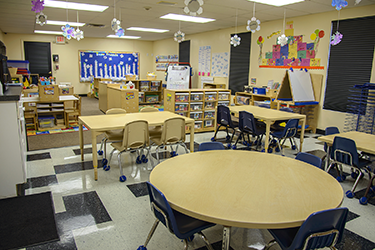 The classroom functions as a community where the children learn to cooperate, negotiate, begin to understand friendship and resolve problems and conflicts. A print rich environment along with our “Get Set for School” writing and readiness program enables the children to practice literacy skills such as vocabulary and language, phonological awareness, knowledge of print, letters and words, comprehension and appreciation and use of books and other texts. Activities explore math concepts such as counting, quantities, sets, one to one correspondence, geometry, spatial sense, patterns, measurements and comparisons, graphing and classifying. Language development and communication occurs when teachers talk with children throughout the day and listen to their responses. Teachers engage individual children and groups in conversations about real experiences, projects, and current events; teachers encourage children to describe their products and ideas, and they respond attentively to children's verbal initiative. 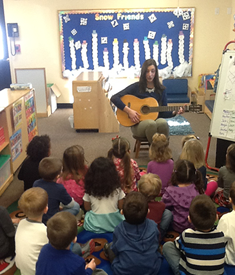 Social and emotional skills develop as the child becomes confident in expressing ideas in spoken and written forms. Literacy is acquired through the knowledge of print seen in their environment and using it in their play. Comprehension skills are exercised through journal writing, the writing center, and the library. 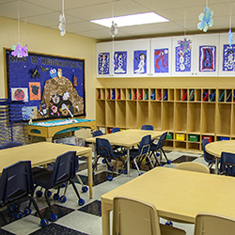 Mathematic development includes an understanding of number concepts, one to one correspondence, patterns and relationships, geometry and spatial sense, measurement, data collection, organization, and representation. Science development occurs through exploration of physical properties of materials and objects, living things, earth, the environment, and technology. Children will understand and use the scientific methods of asking question, observing, and recording their findings and discussing their conclusions. 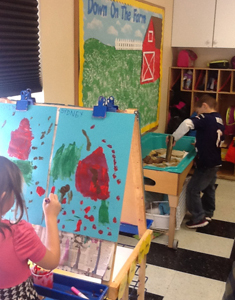 Creativity is provided through a wide variety of art medias and materials for self- expression. Children learn to draw and draw to learn. Physical health and development strengthen large and small muscles using sensory experiences and practicing healthy behavior. A variety of manipulative and writing materials promote eye/hand coordination and fine motor skills. Playground equipment, music and movement activities strengthen balance, coordination and large muscle control.